From the opening track “Gimme Your Love,” Morcheeba’s aptly titled 8th studio album, Head Up High, immediately reminds us how easy it is to fall in love with the sultry voice of Skye Edwards. Throughout their 18-year on again, off again relationship, the UK trio has always remained true to their trip-hop roots, but this time they definitely don’t go it alone. In fact, the Godfrey brothers and Edwards called upon an eclectic collection of artists to add to their already infectious grooves. With the talents of James Petralli of indie-rock group White Denim, Chali 2na, Nature Boy, Rizzle Kicks, and Ana Tijoux featured on the album, Morcheeba is able to incorporate some outside elements which only typify their already fine-tuned trip-hop stylings. Beyond the rap lyricists who lent a hand, the most surprising yet soulful of the collaborations comes from James Petralli of White Denim, who can be heard on “Call It Love,” “I’ll Fall Apart,” and the final track “Finally Found You.” He adds to Skye’s already hypnotizing voice with his country meets blues flavor blending in perfectly. 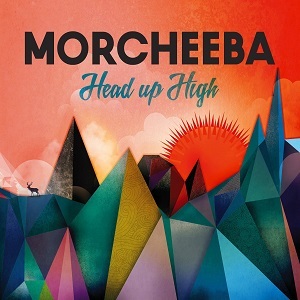 Morcheeba’s Head Up High hits on the highs and lows of love and life, and, reminds us that even though it’s not always easy, they always find a way to make it all sound so sensational.